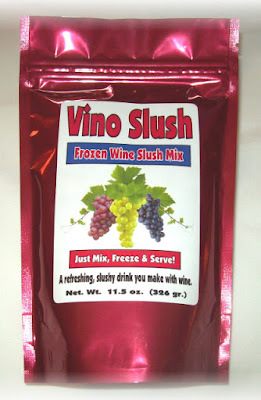 Vino Slush frozen wine slush mix - use with any wine! Just mix it, freeze it and enjoy. Jim Miller, president of Jim Miller Gourmet, shows off some packages of the Vino Slush product he sells. 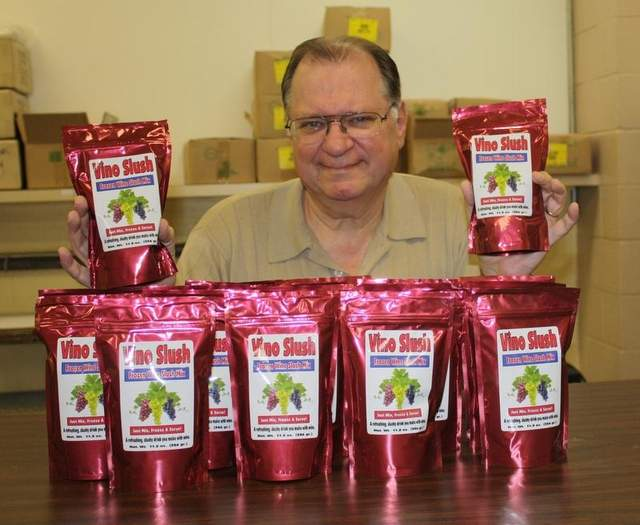 All of Vino Slush's products are mixed and packaged in a Batavia facility. Jim Miller created the Vino Slush for his company, Cherry Orchard Foods (now called Jim Miller Gourmet). 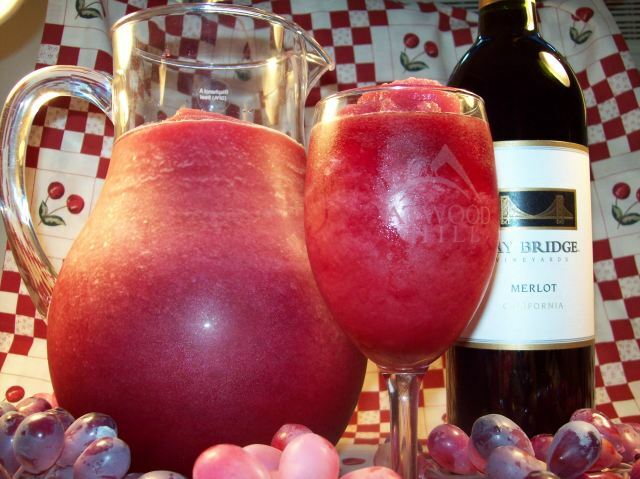 The Vino Slush can be added to wine or fruit juice to turn it into a frozen drink. “I’m just a born entrepreneur. I can’t just watch TV,” said the Union Township resident. He and his wife, Dottie, had a booth at Trader’s World Flea Market selling another person’s pre-made dip mixes. Miller said he decided to take the plunge and make his own. After months of trial and error, he finally developed 15 successful recipes for dip and dessert mixes. And Cherry Orchard Foods was born. “As a whole, these 15 flavors have proven themselves as winners. And the Vino Slush has become the star of the show,” said Miller. The Vino Slush is a mix that turns any flavor of wine or fruit juice into a frozen, slushy drink. Miller developed it after sampling a similar product while on vacation. “It just exploded from the first day the website went up. That’s what made me decide this is the wave of the future,” he said. He has distributors as far away as Canada and as close as the Clermont Springs Deli & State Liquor Agency in Anderson Township. “It’s very good. It’s something that makes wine sweet and slushy, but the people who like it love it. I have people come in and buy six bags,” said Mary Jo Strassel, Clermont Springs manager. Miller said he’s currently working on a sugar-free version of the Vino Slush and hopes to one day develop mixes for cocktails like margaritas and daiquiris. “The Vino Slush doubled our business. We’re acquiring new wholesale accounts all the time. I’m counting my blessings,” said Miller. For more about the Vino Slush, go to www.vinoslush.com. I was at the Anderson Farmers Market on Saturday and came across a booth giving out samples of a product called Vino Slush. Now, don't get me wrong I am certainly NOT a wine snob, but my first reaction was SERIOUSLY! But to my surprise the "wine slushy" was quite refreshing and delightfully different. The booth was very busy and the owner sold completely out of his stock. After talking to the owner Jim Miller via e-mail, he recommended using a very inexpensive wine. He said that he had used wine from Kroger or Walmart that was $2.99 a bottle and it tasted great! Now that's what I call BUDGET wine! For those of you with kids, you can mix up a non-alcoholic version as well. You can substitute the wine with ginger ale, cranberry juice, or sparkling grape juice. Vino Slush comes out as the same consistency as a frozen margarita. It just a little something different for the summer, and would be the topic of discussion at your next party! Jim sells the mix for $10.00 a bag and you can get several uses out of the bag. I hope everyone enjoyed the long Memorial Day weekend, whether with family, at the Taste of Cincinnati, or picking up great bargains! December 17, 2014 - Slush machines are no longer just for dispensing sweet, sugary drinks. While kids and adults alike flock to all types of slush machines that dispense drinks such as Icees and Slurpees, many restaurants and bars are now offering “top shelf” drink concoctions in their machines. And today, some of the most popular alcoholic drinks that are created in professional-grade slush machines contain red or white wine, or other types of high-end hard alcohol. While it is certainly possible to create a wine slush without the assistance of a slush machine – as evidenced by the product produced by Vino Slush – it makes sense for a restaurant or bar wishing to create a wine slush for customers to have one or more behind-the-counter slush machines. The article suggests that wine slushies can be sold at festivals of all types (which allow alcohol), trade shows, cultural events and more. If you are contemplating adding a slush machine to your restaurant or bar, consider a slush machine that can hold a significant number of servings and has the capacity to produce a substantial amount of product so that you never run out. Hot summer days call for a cool treat. 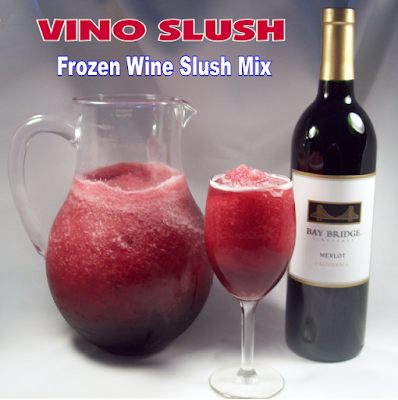 Vino Slush wine slushy mix is an amazingly simple and fresh way to enjoy your favorite wine. Vino Slush is unique in that it doesn’t cover the flavor of your wine; it just enhances it. Pick your favorite wine, blend it up, and you have a unique wine slushy drink all your own. I’ve made these slushies using both the freezer method and the blender method, and they’re both great. I personally like the freezer method because it’s less messy, but the blender is great for when you want a slushy in a hurry. We’ve been carrying Vino Slush in-store for several summers, and it’s consistently a hot item with rave reviews. If you’re not lucky enough to live near us, order it by sending an email to our ordering department. VINO SLUSH MAKES EVERYTHING COOL! Who doesn't love a nice, cold frozen drink during the summer time? Okay, I know it's just about winter right now, but that doesn't mean you can't enjoy a nice frozen or even chilled drink in front of a nice, warm fire. One of my favorite drinks is a frozen drink, mixed with wine....imagine that! It can be chilled, frozen or on the rocks, it doesn't matter. This Vino Slush Mix, shown below, is a mix that you can mix with a bottle of wine...red or white...doesn't matter, but I prefer it with red. All you have to do is mix it, freeze it and then serve. It's as simple as that. When you hear the name Vino Slush, the first thing that may come to your mind is a slushy... and you would be correct, because this Vino Slush Mix, when frozen and then allowed to thaw a bit, becomes a slushy. The Vino Slush Mix contains all natural ingredients: Tea, Citric Acid, Sugar, Natural Flavoring and Beet Powder. When mixed with wine, it tastes absolutely delicious! Not too sweet, but sweet enough. Depending also on the wine you use, it can be sweeter when used with a Moscato wine or less sweet, by using a Merlot. Either way, this tastes divine! I also like to turn this into a Sangria. Just add a bottle of your favorite wine to the mix, add slices of desired fruit and then chill in the frig for a few hours! The fruit actually absorbs the alcohol from the wine and makes for a great Sangria. If you do not drink alcoholic beverages...that's no problem. This Vino Slush Mix tastes just as good in Cranberry juice, Apple juice, non-alcoholic wine, Sparkling juices and Pomegranate juice, without the alcohol content. You can have it both ways and still have a very enjoyable and refreshing drink. AND....since Christmas and the New Year's is about to come upon us, this would make an excellent gift. Anyone who loves wine, this would be the idea gift to give. It turns wine into something totally different. You can purchase this at VinoSlush.com. They have Vino Slush Bulks that you can purchase in 30 lb. cases. Another reason to hit this up for holiday gifts! Have a wedding or party coming up, why not purchase some Vino Slush Mix and see how it impresses your guests. I bet they will be asking what your secret is after their first sip. Serve this wine mix in a nice large pitcher, topped with various fruits at parties or events or frozen and served as a Granita.